Participants in this session came solely from the communities older generation. 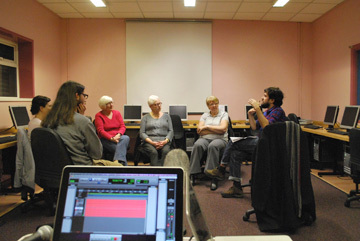 Sound memories and the soundscapes of everyday life were the main focus of this workshop. Our session began by two of the SARC group sharing some writing; personal reflections upon everyday experiences of sound in the past and present. Participants were then invited to share descriptions of their daily routines focusing on auditory experience and sounds that carry personal significance. This exercise presented details of lives moving from the seemingly mundane to memories of past sounds, memories of past evoked by sound, and insights into present lives. Thoughts concerning the radical transformation of soundscape over the course of one’s life came to the fore as a result of the exercise. This demonstrated not only are these changes dictated by the preferred technologies of a time, as discussed in previous workshops, but also by our shifting personal relationships and lives. Participants then discussed sounds they felt provided comfort, all of which were entwined with memory. The workshop concluded with the group being played archival recordings of various horns in order to ascertain which were representative of those heard through Belfast City in the past. Specific horns were instantly identified showing the prominence of sound in memory. This session provided a basis for the reconstruction and discussion of past sounds.